At roi Office Interiors, we know there is competition when it comes to who will furnish your higher education spaces. That’s why we work diligently to help colleges and universities get the spaces they deserve. Virtually all of our furniture is on New York State contract and GSA, and that makes us a great source for higher education projects of all kinds. We take pride in offering only the best furniture from manufacturers experienced in high-use applications and proven warranty policies. We also know that sounds great on paper (or computer screen), but what do we do that goes beyond quality control? We’ve helped high-profile universities with their furniture needs. We’ve helped many colleges and universities get the facilities they need to best meet their higher education goals. Newly built facilities, as well as redesigned spaces in historic buildings, have all benefited from the visions of our designers. We’ve worked on new facilities like science centers and gymnasiums, and we’ve helped redesign faculty offices, administrative offices, classrooms, public areas, dining halls and more. We are proud of the work we’ve done for such prestigious higher education institutions as Colgate University, Syracuse University, Le Moyne College and Hamilton College. We work with designers and architects renowned for creating spaces at colleges and universities. We are very proud of the relationships we’ve established throughout the architecture and design community. We always work to become part of the team and support the architect and designer in their work. Because of the reputation we’ve earned as a team player, we proudly work with many area architecture and design firms that specialize in creating spaces for higher education institutions. We are here to assist, support and help design and architecture professionals succeed in providing their client with the best project possible. We create classrooms that enhance the dynamic process of learning. At roi Office Interiors, we understand that classroom design must be two-fold: it must meet the needs of the educator using the room to teach, and it must accommodate the learner in a way that’s both versatile and comfortable. We create classrooms in which the education furniture and design adapt to the use and the user – not the other way around. We make sure our designs never compromise the health and the comfort of the users, and we take subtleties like color and form into account so that the classroom is an effective learning space. We take a unique approach to every administrative office we design and furnish. When colleges and universities call upon us to help design and furnish their administrative offices, we never know exactly where the adventure is going to take us. Often, we discover that we need to create comfortable, functional offices in spaces that already exist – sometimes, very small spaces in historic buildings! 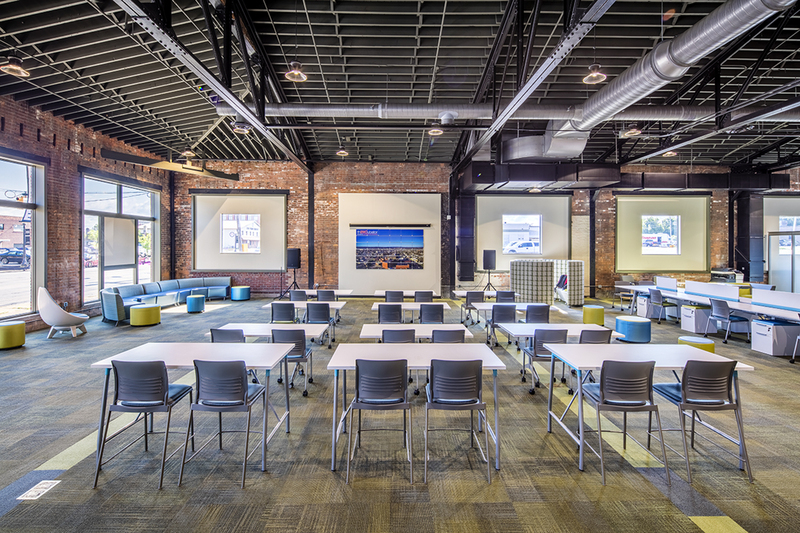 Our design team maximizes the use of vertical spaces and uses the latest products to create an office space that will meet your needs and exceed your expectations – whether you’re located in a brand-new, completely modern building, or in a 19th century brick building on a hilltop! We’re always looking for new, innovative ways we can furnish educational spaces. At roi Office Interiors, we never rest on our laurels. We’re always looking for new ways to help higher education institutions get the spaces they want that students and professors will enjoy. We love products that help set our clients apart and offer comfort to their end users. For instance, we now provide an exclusive line of unique and comfy furniture from the Belgian company SIXINCH. This furniture is foam coated and created using a state-of-the-art process that turns your ideas into furniture. We proudly strive to bring innovation to the design scheme of your college or university space. At roi Office Interiors, we’re dedicated to helping you create a comfortable space that’s warm, inviting and conducive to both teaching and learning. With convenient locations in Rome, Syracuse, Albany and Ithaca, we’re ready to help you. To learn more about the higher education services we offer, please give us a call at 315-334-1388, or fill out our convenient online contact form, and we will be more than happy to assist you.